People have called AT&T about buying CNN; was Rupert Murdoch one of them? AT&T says it is not going to sell CNN. It has rejected the notion of spinning off CNN to win government approval to acquire Time Warner, CNN's parent company. But multiple media moguls put out feelers about possibly buying CNN earlier this year. 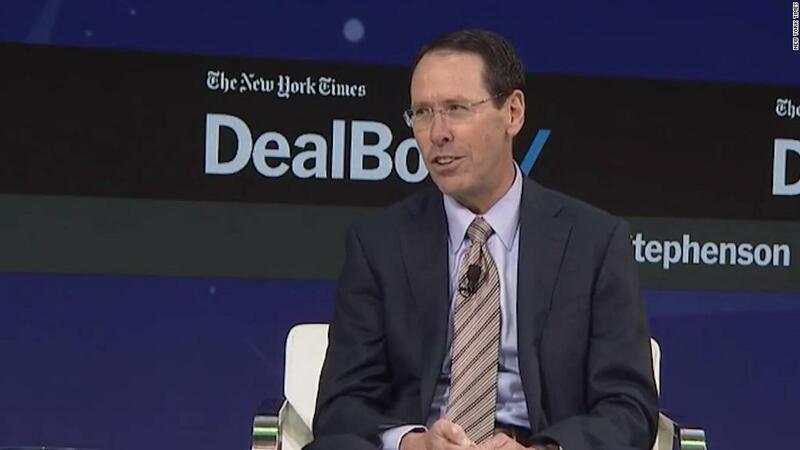 "There have been a lot of people" who have "expressed interest in CNN," AT&T CEO Randall Stephenson said Thursday. According to a new report, Fox News CEO Rupert Murdoch was one of them. Reuters reported on Friday that Murdoch phoned Stephenson "twice in the last six months and talked about cable network CNN." Two sources with knowledge of the calls confirmed to CNNMoney that the calls took place in May and in August. But there is disagreement about what exactly was said. Reuters cited one source saying that Murdoch "offered to buy CNN in both conversations," while "another source said Murdoch had 'zero interest' in owning CNN." Confusing, to say the least. But it's clear that the two men spoke, which is intriguing in and of itself. Murdoch sought to buy all of Time Warner in 2014, but his bid was rejected. If that deal had happened, CNN would likely have been sold. It was impossible to imagine government regulators allowing one company to own both Fox News and CNN. Flash forward three years. Time Warner is being acquired by AT&T, but the Justice Department is putting up roadblocks. The DOJ's antitrust division chief, Makan Delrahim, believes the acquisition would cause anticompetitive harm to consumers, according to sources. He recently surprised AT&T executives and outside antitrust experts by demanding that AT&T sell off some assets to satisfy the government's concerns. One suggestion was to sell Turner, the unit of Time Warner that includes CNN. AT&T is reluctant to do so. Stephenson said Thursday that he is in "advanced stages of negotiations" with the Justice Department. But if there's no agreement, "we're prepared to litigate now," he said. At the conference, Stephenson disputed claims that he offered to sell CNN to win government approval. "I have never been told that the price of getting the deal done was selling CNN. Period. And likewise I have never offered to sell CNN," Stephenson said. "There is absolutely no intention that we would ever sell CNN. So take those two off the table." When asked about concerns that President Trump, a frequent critic of CNN, is interfering in the deal review, Stephenson said "I have no reason to believe that" is happening. On Friday, hours before the Reuters report came out, Vanity Fair published a story about the Murdoch factor -- specifically how Murdoch has privately opposed the AT&T-Time Warner deal. The story noted that Murdoch and Trump speak frequently and said that some Time Warner executives see Murdoch's "hidden hand" at work. A Murdoch spokesperson called that "laughable and categorically untrue," and told Vanity Fair, "if Trump is doing this to punish CNN we have nothing whatsoever to do with it." On last Sunday's "Reliable Sources," Murdoch biographer David Folkenflik also mentioned Murdoch's opposition to the AT&T deal. "He would love for it to be killed" or at least "slowed down and made more costly, made more problematic," Folkenflik said. Spokespeople for Murdoch and Stephenson declined to comment on Friday.